3-STRIPES CREWNECK SWEATSHIRT A SWEATSHIRT MADE OF COZY FLEECE. Celebrate the 3-Stripes. This ..
3-STRIPES TEE A COTTON TEE WITH 3-STRIPES STYLE. Since '72, the Trefoil has stood for authenti..
BB TRACK JACKET A TRACK JACKET WITH A HERITAGE LOOK. The first adidas track suit debuted in 19..
BB TRACK JACKET The first adidas track suit debuted in 1967 and became a streetwear icon. 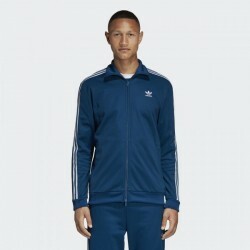 This tr..
Black Friday Track Jacket Inspired by iconic adidas track suit style, this men's track jacket is .. CAMOUFLAGE TEE A TEE WITH A CAMOUFLAGE LOOK. Camouflage print gives graphic edge to a streetwe.. CAMOUFLAGE HOODIE A HOODIE WITH A CAMOUFLAGE LOOK AND A LARGE TREFOIL. Panels of camouflage pr.. CAMOUFLAGE HOODIE A HOODIE WITH A CAMOUFLAGE LOOK. Panels of camouflage print give this street.. CAMOUFLAGE WINDBREAKER A JACKET WITH A CAMOUFLAGE LOOK. Panels of camouflage print give this s..
CREWNECK SWEATSHIRT A PULLOVER WITH TIMELESS 3-STRIPES STYLE. The best of adidas past, remaste..
DEGRADE TRACK JACKET A TRACK JACKET WITH VAPORWAVE-INSPIRED GRAPHICS. In tribute to the art st.. ESSENTIAL CREWNECK SWEATSHIRT A SIMPLE PULLOVER FOR EVERYDAY COMFORT. Minimalist and modern. T.. ESSENTIAL TEE A CASUAL TEE WITH TREFOIL STYLE. A daily essential. This t-shirt has a clean loo..
Flamestrike Tee Ignited by the flame of football. A Flamestrike design from the 1990s and 2000s i..
FLAMESTRIKE TRACK JACKET A TRACK JACKET WITH A FLAMESTRIKE PRINT INSPIRED BY VINTAGE DESIGNS. ..
FLAMESTRIKE TRACK JACKET A TRACK JACKET WITH A FLAMESTRIKE PRINT AND A WATER-REPELLENT FINISH. ..
HOODY SWEATSHIRT WITH CONTRASTING INSERTS AND SPECTACULAR DETAILS. Sweatshirt with wide retro ..
MEN'S 3-STRIPES TEE A COTTON 3-STRIPES TEE INSPIRED BY THE '70S ORIGINAL. This iconic 3-Stripe..
Outline Sweatshirt Clean and casual style. This sweatshirt showcases core adidas DNA on the chest..
Outline Hoodie Clean style with a casual feel. This hoodie exposes core adidas DNA on the sleeves..
OUTLINE HOODIE A HOODIE WITH A BOLD OUTLINE TREFOIL. Launched in 1983, Adicolor represents cre..
RADKIN CREWNECK SWEATSHIRT A FRENCH TERRY SWEATSHIRT THAT'S STYLED WITH WOVEN SLEEVE PANELS. D..
SST TRACK JACKET AN SST TRACK JACKET WITH CONTRAST PIPING AND A TWO-WAY ZIP. This men's jacket..
TREFOIL HOODIE A COZY HOODIE THAT SHOWS OFF ADIDAS PRIDE. The Trefoil has been standing out si..
TREFOIL TEE A LONG SLEEVE TEE INSPIRED BY STYLES FROM THE ARCHIVE. Remastering archive designs..
TREFOIL TEE A SOFT TEE WITH A BOLD CONTRAST TREFOIL LOGO. The Trefoil has been making its mark..
TREFOIL WARM-UP CREW SWEATSHIRT A TREFOIL SWEATSHIRT MADE OF SOFT FRENCH TERRY. This sweatshir..
MEN'S TREFOIL WARM-UP CREW SWEATSHIRT A SWEATSHIRT MADE OF FRENCH TERRY WITH A TREFOIL LOGO GRAPH..
FLAMESTRIKE TRACK JACKET A TRACK JACKET WITH A FLAMESTRIKE PATTERN AND A WATER-REPELLENT FINISH. ..
SST WINDBREAKER A RETRO-STYLE WINDBREAKER WITH CONTRAST PIPING. Inspired by the adidas Superst..
3-STRIPES PANTS SIMPLE, SPORTY PANTS MADE OF COZY FLEECE. Launched in 1983, Adicolor represent..
ADIBREAK TRACK PANTS SNAP BUTTON PANTS INSPIRED BY THE ARCHIVES. Rewind it back to the '90s wi..
BB TRACK PANTS SLIM-FITTING TRACK PANTS WITH PINTUCK DETAILS. The first adidas track suit debu..
DEGRADE TRACK PANTS TRACK PANTS WITH VAPORWAVE-INSPIRED GRAPHICS. In tribute to the art style ..
FLAMESTRIKE TRACK PANTS TRACK PANTS WITH A FLAMESTRIKE PATTERN INSPIRED BY VINTAGE DESIGN IDEAS. ..
FLAMESTRIKE TRACK PANTS TRACK PANTS WITH A FLAMESTRIKE PRINT AND A WATER-REPELLENT FINISH. Arc..
FLAMESTRIKE TRACK PANTS TRACK PANTS WITH A FLAMESTRIKE PRINT INSPIRED BY VINTAGE DESIGNS. Late..
Outline 7/8 Pants Clean style with a casual feel. These pants create an effortless look with a lo..
RADKIN WINDBREAKER A WINDBREAKER WITH 3-STRIPES ON THE SHOULDERS. Late '90s football training ..
TREFOIL PANTS SIMPLE, SPORTY PANTS MADE OF FRENCH TERRY. Launched in 1983, Adicolor represents..
3-STRIPES SWIM SHORTS SWIM SHORTS INSPIRED BY ARCHIVAL RUNNING SHORTS. When the Trefoil debute..
3-Stripes Snapback Cap Clean, contemporary adidas style defines this snapback cap. It's built in ..
ADICOLOR BUCKET HAT A CLASSIC, EASYGOING STYLE REMADE FOR EVERYDAY STREET WEAR. A familiar sha..
Classic Camouflage Cap An allover camouflage print gives this classic cap a bold new attitude. It..
Curved Trucker Cap Truckers, camouflage and Trefoils come together in a winning combination. This..
TREFOIL BASEBALL CAP THE SPORTY CLASSIC, DONE IN A COMFORTABLE COTTON BUILD. With a perfectly ..
TREFOIL TRUCKER CAP THE FAMILIAR TRUCKER SILHOUETTE, AMPLIFIED WITH STRONG ADIDAS BRANDING. On..
DUFFEL BAG A MODERN DUFFEL THAT'S GREAT FOR CARRYING LARGE LOADS. Leave nothing behind with th..